Tomorrow: Data Visualization II Workshop! 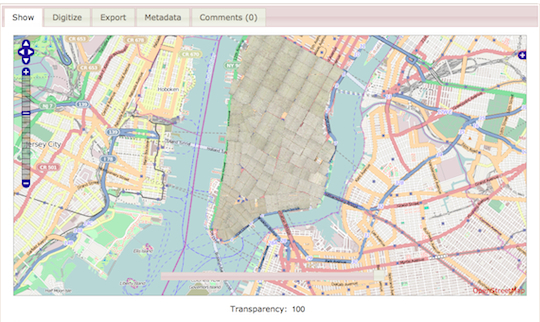 Tomorrow’s Digital Praxis Workshop will be Data Visualization II! I’m kind of freaking out about it. This one will really take it to the next level, with an under-the-hood look at creating interactive visualizations using d3. Attendees of the workshop are strongly encouraged to bring their own laptop computers and should have, or create, a github account prior to the session. Note: Sarah works on a Mac – but the workshop will also be accessible and beneficial to users of other operating systems (including the room’s library-provided desktop computers). Looking forward to seeing the Praxis students there (Mina Rees Library, Concourse level, Room C196.02) tomorrow after the class! This entry was posted in Announcements, Event Announcements, Fall 2014, Lectures and Workshops, Uncategorized and tagged d3, data visualization, interactive on November 5, 2014 by Micki Kaufman. It was standing room only in Micki’s info viz workshop on Thursday. In order to make the demo more interesting, she used a dataset about the class attendees. We all entered our names, school, department & year in a shared online doc which became the basis for parts of the demo. We saw how to take text and clean it up for entry into Excel using a text edit tool, Text Wrangler. Tabs! Tabs are the answer. Data separated by tabs will go into individual cells in Excel, making it easier to manipulate once in there. Tabs>commas, apparently. Once the data was in Excel, we saw some basic functions like using the data filter function, making a pivot table, an area graph and a stacked area graph. After Excel we moved on to Gephi. Unfortunately none of the participants could get Gephi on our computers, so we just watched Micki do a demo. Using our class participant data, she showed us the steps to get the data in and how to do some basic things to get a good looking visualization, and how to play around with different algorithms and options. This was a pretty small dataset with few connections, so to illustrate some of the more complex things Gephi can do, Micki showed us examples from her own work. For me, this was the best part. I think Liam linked to it earlier, but I highly recommend you look at the force-directed graphs section on Quantifying Kissinger. Stephen brought up the ‘so what?’ factor with regard to Lev Manovich’s visualizations. I thought Micki’s provided a good counterpoint to that, as she explained how certain visualizations made patterns or connections clear—things that might not have been revealed in another type of analysis. Overall this was a very informative and useful workshop. It gave me courage to go home and play with my data in Gephi in ways that I didn’t feel able to before, and I hope it encouraged others to get started on their own projects. This entry was posted in Fall 2014, Lectures and Workshops, Student Responses to Lectures & Workshops and tagged Data Analysis, Gephi, infoviz, Technology on November 1, 2014 by Sarah Cohn. Given our discussions these past weeks, it seems to me that the points of departure are numerous. I’m reminded of Sarah’s post on mapping the urban setting of fictional characters, when I think about how this tool can help recreate the urban setting of historical characters/personages in today’s context. All one needs is a time period and location, if the Map Division has a corresponding map, lo, and behold! you can see the past and present streetscapes simultaneously. From an urban planning perspective, it is fascinating to see how the cityscape wears the passage of time and explore possible lessons for urban design. I expect it also will help planners visualize and chart the imperceptible movement of real estate, the steady shift of the cityscape over the underlying landscape, which is only possible with tools such as this. For those of you interested, there is also a helpful tutorial video on their website to get you started on the project, and helpful Map Division staff are available for tech support. 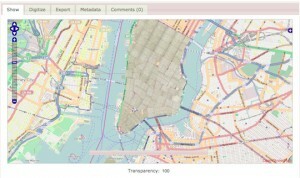 This entry was posted in Fall 2014, Lectures and Workshops, Resources & Links of Interest and tagged dhpraxis14, digital humanities, Geospatial Technology, Map Warper, mapping continuum, Tracking change on October 16, 2014 by madi. In class last week I suggested that we might want to share overviews from the workshops here since not all of us can make the Thursday evening DH workshops. I suggest we keep these reports broad in scope and brief in text. Here’s my overview of the twitter workshop last week. The workshop format was pretty informal. Approximately 12 students sat at computer lab portals in the subbasement library while we perused the twitter-sphere. *(Make a note) Some of these labs are only accessed through the library, not the main elevators. The teaching fellows (is ‘fellows’ the masculine use of the word?) flipped through various accounts demonstrating how twitter can increase your profile on the web. For example: If you have a common name, your name may be associated with several people on the search engines, including criminals. To mitigate this, think of distinguishing yourself by adding a middle initial to your name and tweeting often to raise your visibility. Go to google. Search your name. See what comes up. We noticed that Micki Kaufman got a big burst of twitter attention by way of a recent sharing of information and images. Congrats. Suddenly one can become a “Twitter Star” as in the case of many prominent professors who have written books and have a great number of followers. In these cases a great many more people may be following you, than you are following. 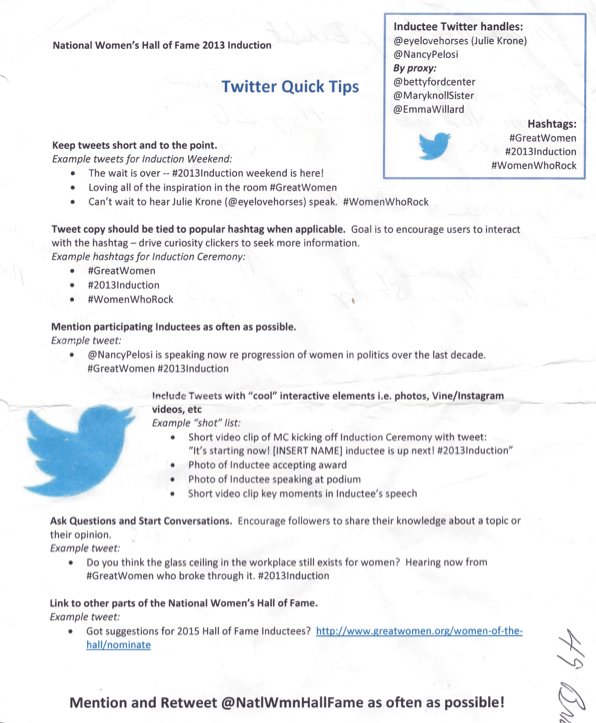 I’m attaching a twitter quick tips sheet here. It was for an event a year ago, but if you substitute #DHpraxis14 as the hashtag, and our classmates twitter handles (their accounts) to your tweets, you can use this good and simple guide to make some practical twitter sense. And, FYI – you do not need to be a twitter fan to have a small amount of success. I don’t really “love” twitter, but I “do” it, simply because its part of the digital world in which we live. This entry was posted in Fall 2014, Lectures and Workshops, Resources & Links of Interest and tagged dhpraxis14, Twitter Help, Twitter Report, Twitter Tweet Sheet, Twitter Workshop on October 7, 2014 by (Martha) Joy Rose.